Auction ends: April 17, 2016, 10:39 AM PDT. Comments: A long border of Bruges Bloemwerk. Irregular picoted brides with ‘islands’ where some groups of brides meet. Single woven tally fillings, and no raised work, not even a really obvious gimp. These are all typical features of Bloemwerk, although the motifs are a little atypical, a bit more naturalistic. Damage: Seller cites a few pulls. Soilage: Looks clean, seller notes the whiteness of the piece. 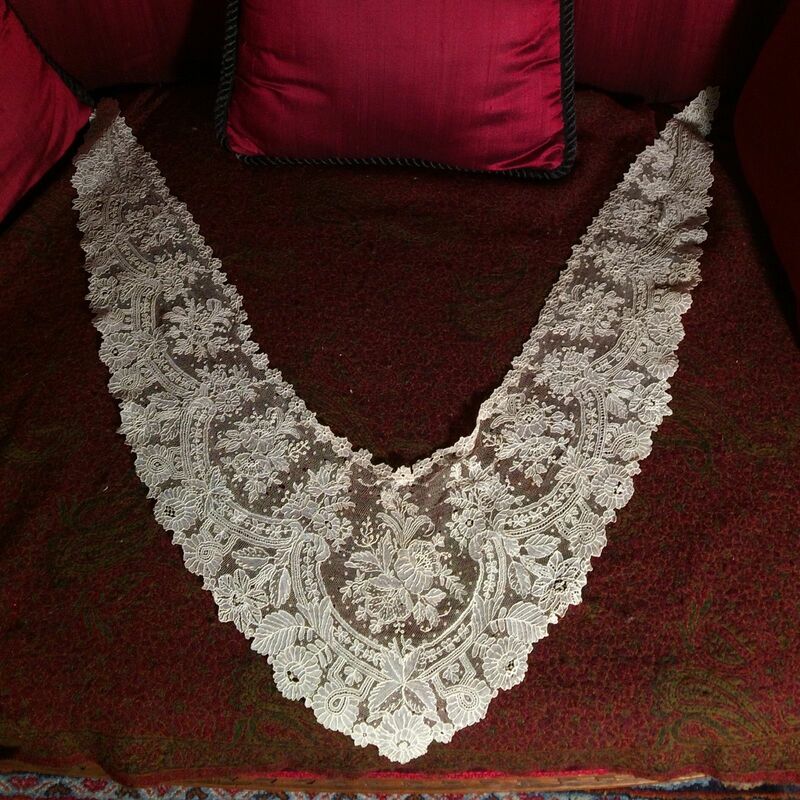 http://tinyurl.com/hdv8ady A Pretty Antique Handmade Brussels Large Collar. Size: 42 cm x 54 cm laid flat. Auction ends: April 17, 2016, 10:45 AM PDT. Comments: A dress front of Duchesse de Bruges. This is more typical of Duchesse than the previous piece. 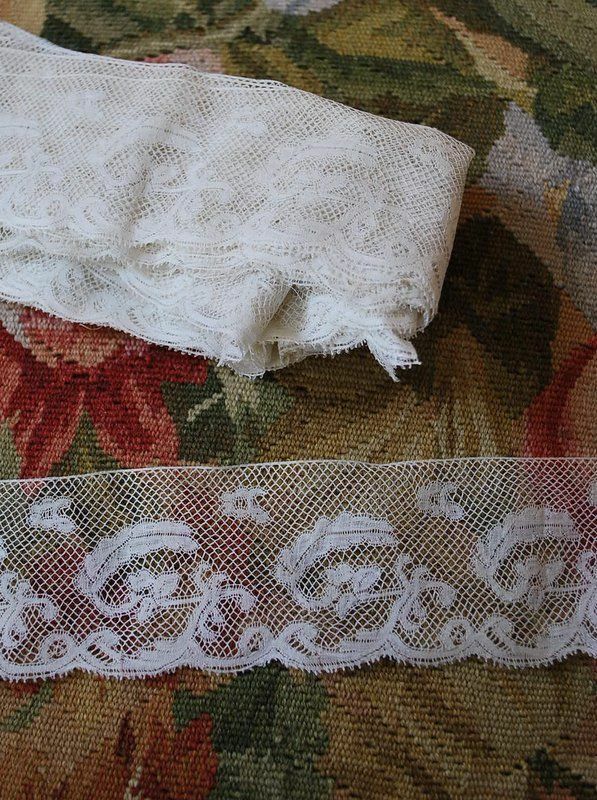 There’s a tiny bit of raised work on half-stitch background, and a ground of irregular brides, no picots. Conventional motifs. Sold for £28.00, 1 bidder. Size: #1 Not given. #2 Not given. I’ve written to both sellers about this. April 23, 2016, 1:55 AM PST. 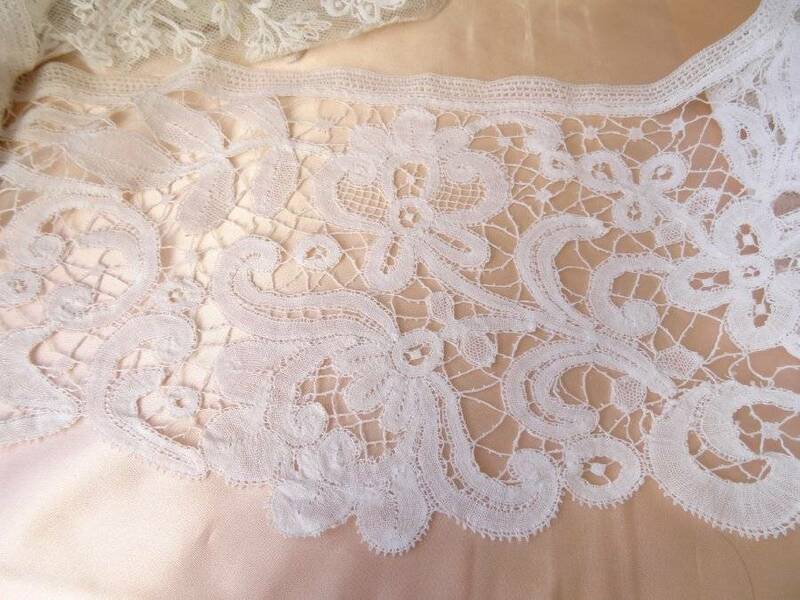 Comments: English oak lace horses come up occasionally on eBay (sometimes with contemporary pillows and bobbins), but it is astonishing that we have two this week. I’m thinking the 2nd one might be earlier given the way the joinery is done. It also has a more handcarved appearance, and the brace from the single leg to the support is unusual. 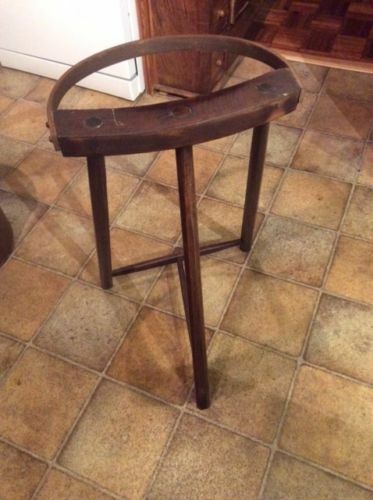 The first one is a more typical example, where the support to the single leg is attached to the ‘footrest’, and the ‘horseshoe’ is just a single thin piece of wood bent into shape. 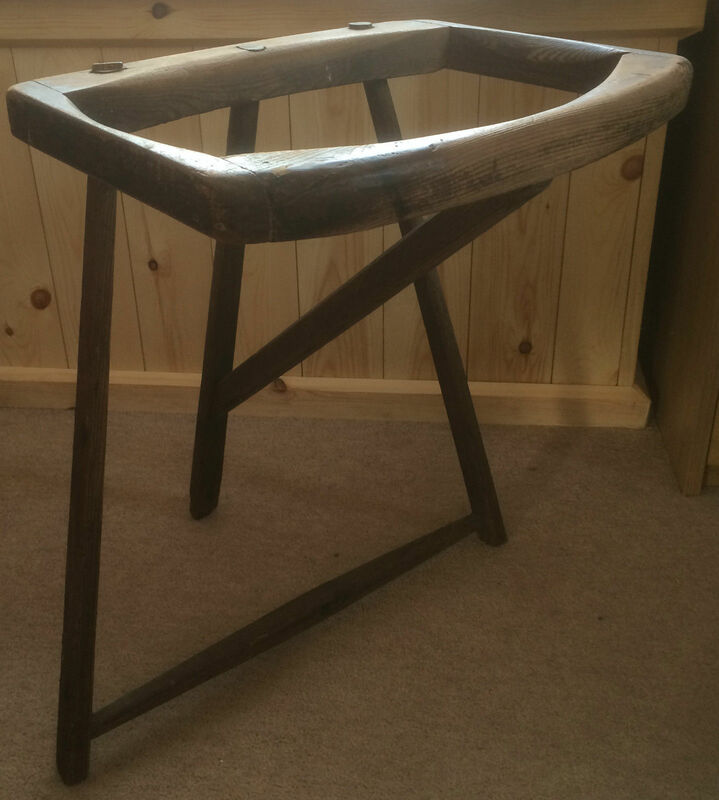 The only unusual thing about the first one is that the hoop has no support extending off the stand legs – usually this means two small support pieces attached to the upper part of the legs to the ‘horseshoe’. I have 6 of these in my collection, and soon will be doing a Collecting post about them. There are many variations. 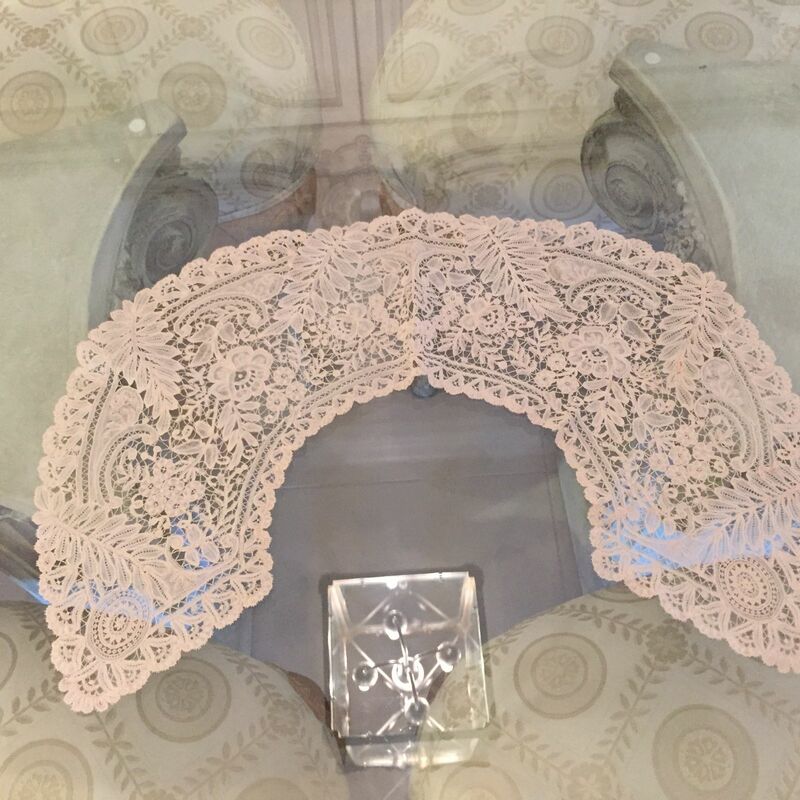 Provenance: #1 came from the house of an elderly lady lived on the borders of Buckinghamshire and Bedfordshire – both Counties known for their beautiful lace. This horse belonged to her mother. Wood split through tenon on the left hand side of the leg support piece on #2. Might have happened when the wedge was put in. Does not go all the way through. Finish: Expected patina on both. Sold for £79.00, 3 bidders, and boy is shipping to the USA expensive! Auction ends: April 17, 2016, 4:00 PM PDT. Comments: A Point de Gaze handkerchief, no raised work. Note the connected picots around the edges, resembling Alençon horsehair. Designs are quite simple, with an impressive chain of heavy rings around the center ‘mode’ of the corner flowers. Note, the attachment to the center cloth could be better, the motifs overlaps the cloth. I wonder if it is a replacement. Damage: A few small holes and pinholes upper left mesh. Occasional stray thread on one edge. Soilage: Looks clean, but seller thinks the center cloth needs ‘refreshing’. Sold for $41.00, 3 bidders. Auction ends: April 17, 2016, 9:20 PM PDT. Comments: A Point de Gaze shawl collar, no raised work. Very few decorative ‘mode’ fillings, just some simple rings. Fairly naturalistic flower design with swag work, and a line of small buds around the neckline. The design is quite dense, with round esprits throughout. Damage: Small holes and pinholes in the mesh mainly on the back and one side. A few pinholes in the clothwork. Sold for $177.50, 2 bidders. Auction ends: April 18, 2016, 7:11 PM PDT. 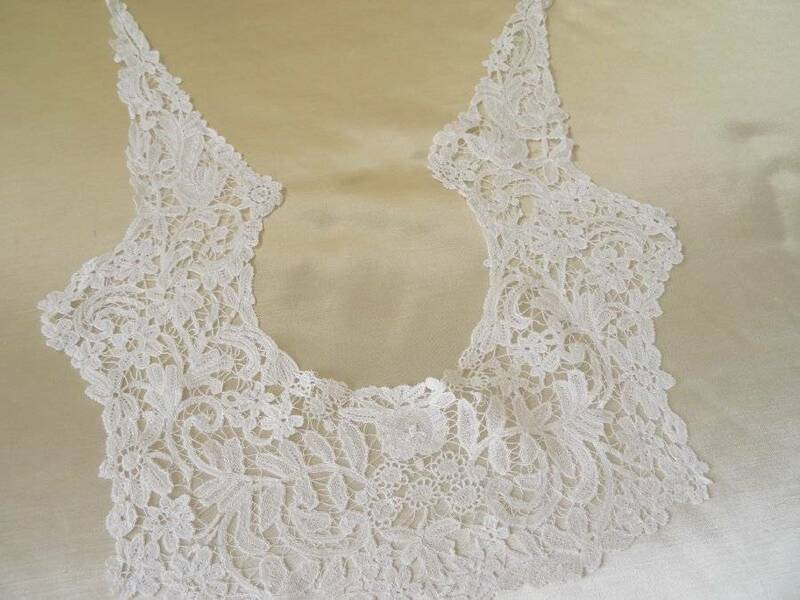 Comments: A Brussels Duchesse collar. The only Point de Gaze included is an elaborate decorative ‘mode’ medallion at the collar outer corners. 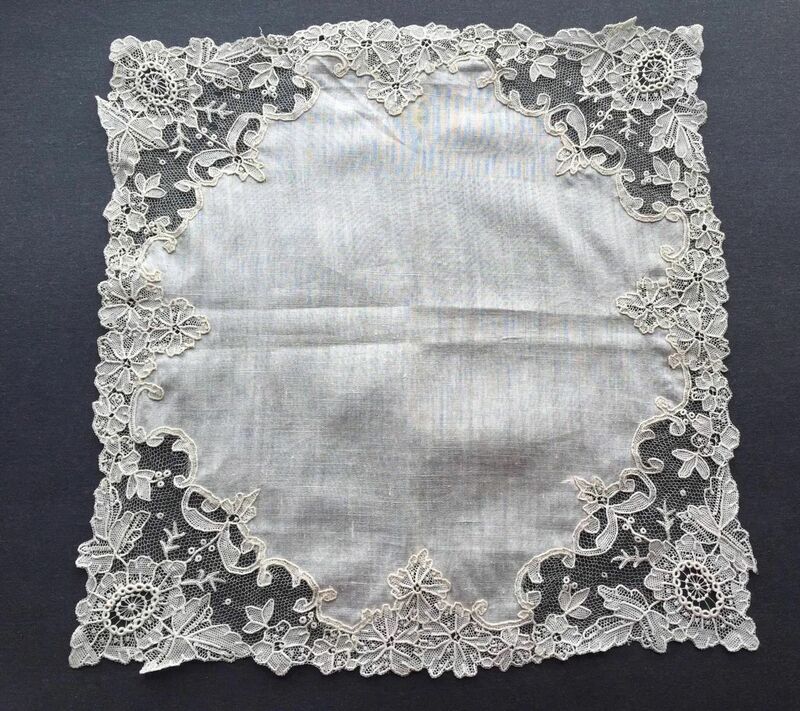 Typical Duchesse motifs, no raised work, but there are designs embedded in halfstitch background. Finish: Fold crease at the back. Auction ends: April 18, 2016, 7:14 PM PDT. Comments: A Duchesse de Bruges lappet scarf. Nicely executed, gimp only which puts it more on the Bloemwerk side. Simple motifs, effectively put together. Damage: A little weakness around the discolored area on one side. Soilage: Seller cites a cream (ivory) color. Some localized brown spots. Finish: No obvious creases or winkles, although I can’t see the back midpoint. Size: 1.5″ x 156″ (measurement consistent with the ‘4m’ written on the tag). Auction ends: April 18, 2016, 7:17 PM PDT. Comments: A narrow insertion of white Chantilly. Wish the tag was intact, it might give the origin of the piece. Belgian or French, I’m not sure. I can’t tell if it is silk or cotton, but I suspect cotton which would argue for Belgium. Simple wave pattern with honeycomb filling. Modifications: None. Looks like the ends are original start and cutoff. Finish: No obvious creases or winkles, looks unused. 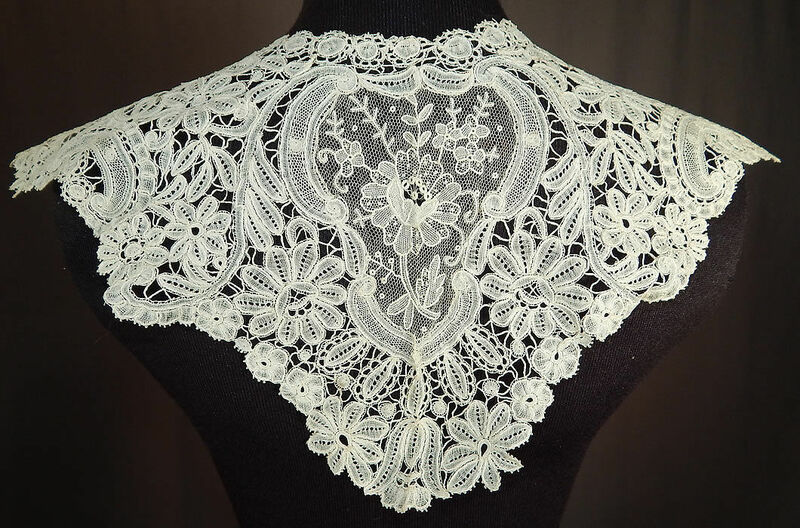 Size: 16″ neckline, 8″ deep, 34″ around bottom. Auction ends: April 18, 2016, 8:33 PM PDT. Comments: A deep collar of Brussels Duchesse with one raised petal rose. There seems to be a little raised work in the bobbin swags (not sure), but most of the bobbin motifs have a gimp and are more in the Bloemwerk style. All the motifs are fairly large. Finish: I think there’s a fold crease down the center back. Auction ends: April 19, 2016, 1:32 PM PDT. 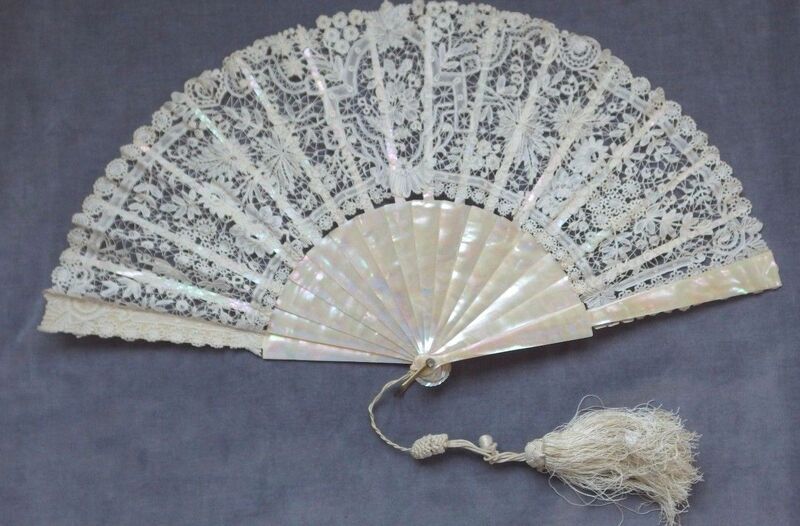 Comments: A fan of Duchesse de Bruges with Mother of Pearl sticks. A little raised work on the strapwork, and it has a good naturalistic design. Excellent technique. Original tassel. 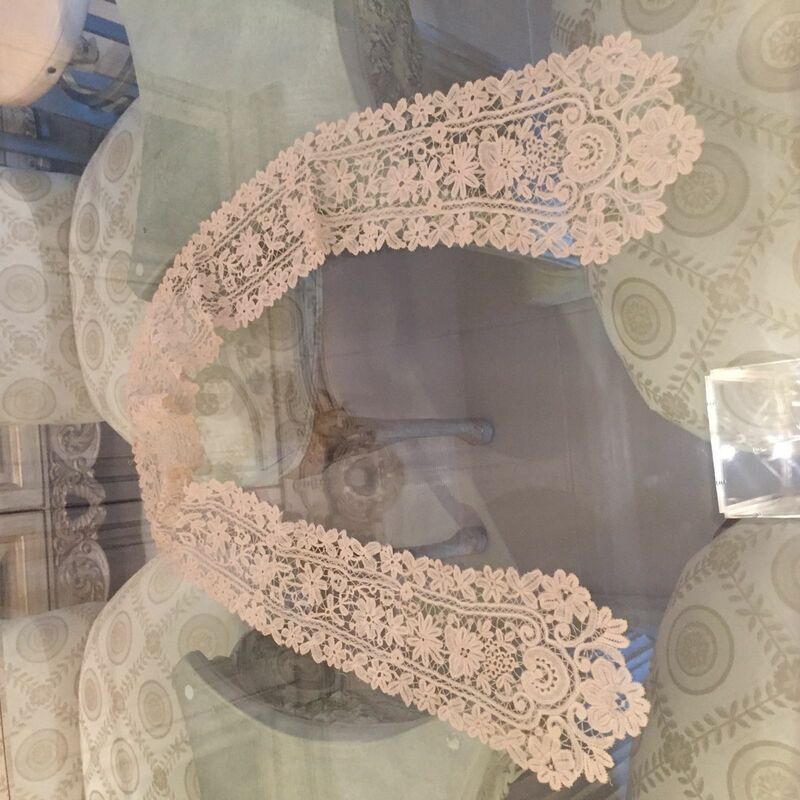 Damage: Lace is loose on two sticks. 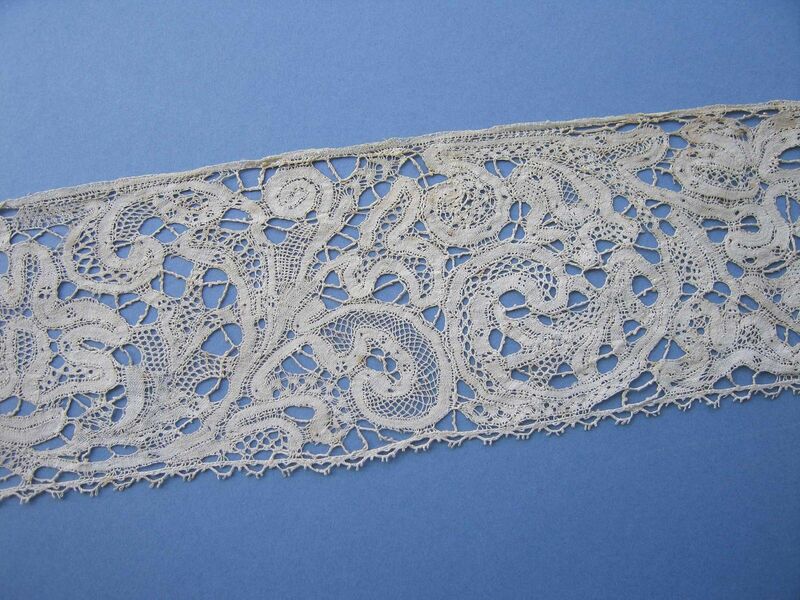 Comments: A runner with a deep border of Brussels Duchesse – unusual to find this lace in this form. I’m not sure if the Point de Gaze roses (with no PtdG ground) have raised petals, but there’s a lot of raised work on halfstitch background. Some PtdG inserts at the ends with rows of decorative ‘mode’ fillings against the standard ground. Quite an effective piece, although the attachment to the cloth is a little rough. Finish: Some minor soft creases. $138.50, 7 bidders, reserve not met. 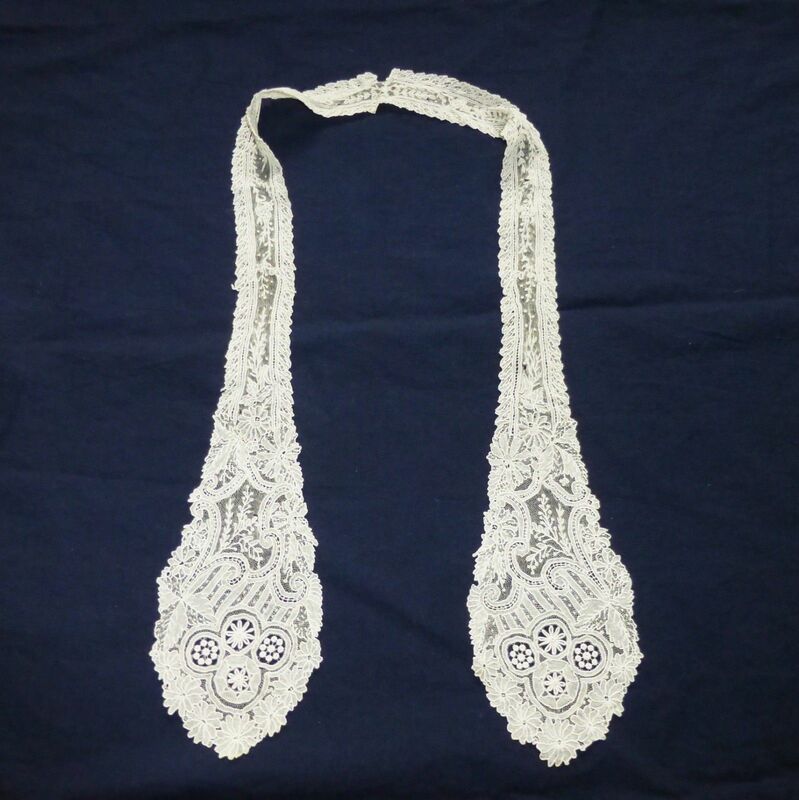 http://tinyurl.com/hg3l7gd ANTIQUE FINE HAND MADE LACE LAPPET COLLAR SCARF SOFT off WHITE Point de Gaze? Auction ends: April 19, 2016, 7:05 PM PDT. Comments: A lappet scarf of Point de Gaze. No raised work, and minimal mesh. Note the 4 nicely done decorative ‘mode’ fillings at each end. The design of thin branches is quite effective, and a nice counterpoint to the thicker edge and massive ends. Modifications: Might be seamed together at the back, but it’s not clear what was originally intended. Damage: Some pinholes in the mesh. Separation of the back seam. Soilage: Seller cites a little light yellowing. Sold for $58.00, 1 bidder. Auction ends: April 20, 2016, 12:36 PM PDT. Comments: A narrow insertion of Honiton guipure. Snails/slugs style, very nicely made with tight weaving. There are few woven tally leadworks (some used at the termination of leaves). Bold, very clean design. Sold for $31.00, 2 bidders. 9 yards in 3 pieces (2 yds, 3 yds, 4 yds) x 2″ wide. Auction ends: April 21, 2016, 9:07 PDT. April 21, 2016, 9:07 PDT. 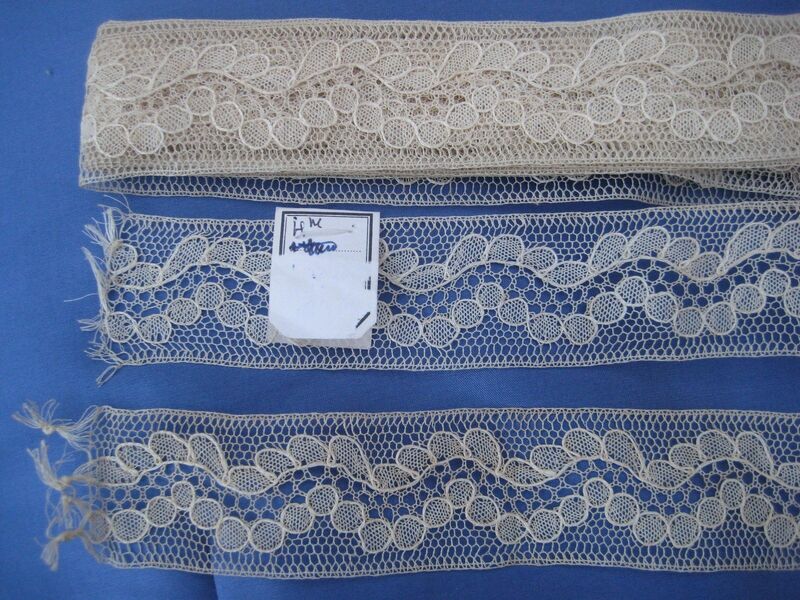 Comments: Two borders of square mesh Valenciennes from the same seller. The first is fairly wide and quite long. I have the same pattern in my own collection, however with 4 rows of esprits above the pattern rather than this piece’s 2 rows. An interesting piece with some nice fillings. The second piece(s) have a precise design with a single bud used as the esprit. Both are Belgian examples, probably from Ypres, where work of this quality was often done. Finish: Vertical fold creases in both. Auction ends: April 22, 2016, 11:10 AM PDT. 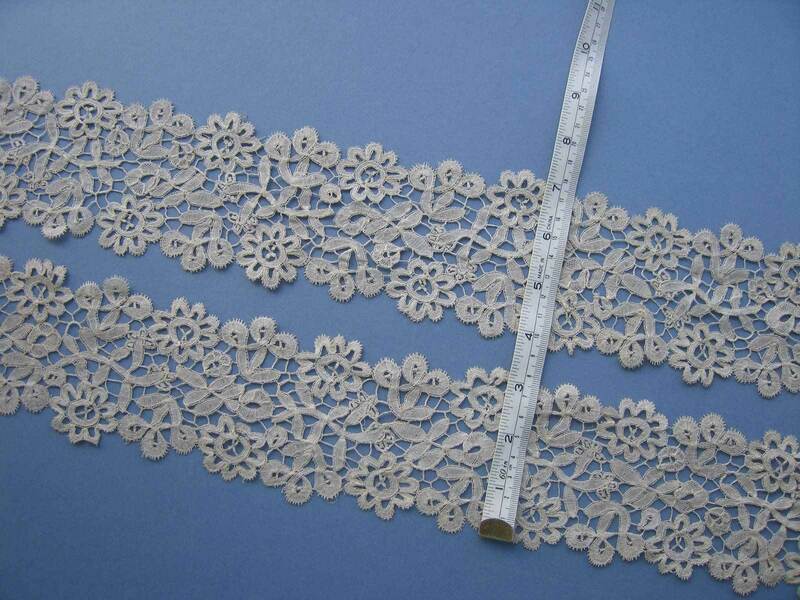 Comments: A Flemish pieced bobbinlace which might be an earlier piece. The threads carried over on the back are often cited as typical of Flanders, but you do see it in Milanese also. These tapes are decorated with diamond windows and sometimes breaks into more elaborate patterns. Some nice fillings. 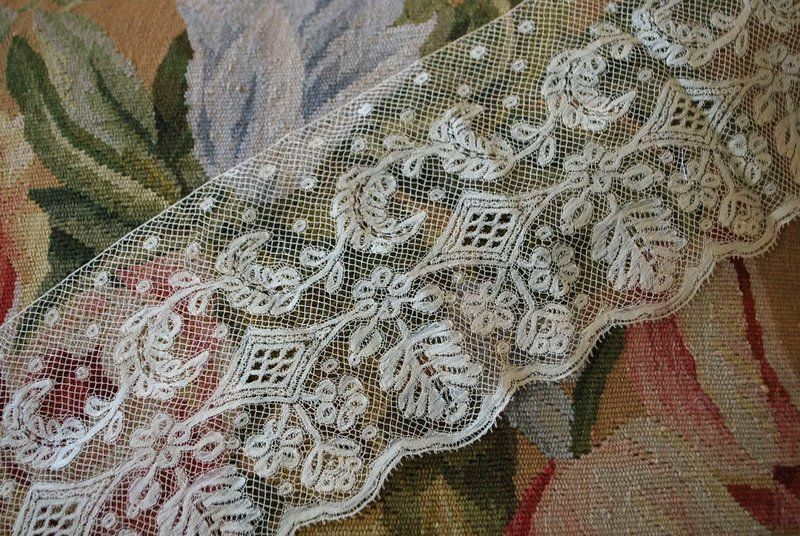 Hard to attribute origin, this kind of lace was extensively copied, but the general condition and patterning makes me lean toward Flanders. Damage: a few small holes, some breaks in the header. Soilage: Seller cites a deep cream color. A little red staining.